Mini-PCI socket, CompactFlash socket, DC 12V input. Taiwan Commate Computer Inc.(COMMELL), the worldwide leader of Industrial embedded SBC, introduced the 3.5" SBC - LE-366 with the energy-saving 0.9 watt AMD Geode LX 800 ( 500MHz) processor, delivers the most performance per watt in the industry today, the system memory with one 200-pin SO-DIMM socket supports up to 1 GB DDR SDRAM. Coupled with the AMD Geode CS5536, offers a complete set of features that can deliver full desktop functionality to embedded and portable devices. Besides the most performance per watt, the LE-366 3.5" miniboard includes integrated AC97 Audio, hard disk drive (ATA-6), 4 x USB 2.0, Giga LAN and Two serial interface. For graphic, CRT (SXGA), LCD (UXGA) are supported.18-bit single channel LVDS connector with 3.3V/5V supply, the other features come with PS/2 keyboard, mouse, silm FDD, and GPIO port. Also integrated Mini-PCI slot, 1 x Mini-PCI slots uses Mini-PCI add-on card for easily using any wireless card or other add-on cards. Additionally, LE-366 is equipped with CompactFalsh Interface for easily using any memory card. LE-366 provides versatile applications for entertainment, business, education, and embedded markets. Software support is offered for all Windows and Linux based applications. CPU: AMD LX 800, up to 500MHz. Memory: 1 x 200 pin 266/333/400MHz SO-DIMM up to 1.0GB SDRAM. Chipset: AMD LX800 and CS5536. VGA Interface: AMD Geode LX 800 with integrated graphics engine. LVDS Interface: 18-bit single channel LVDS interface. PCI Enhanced IDE: UltraATA33 IDE up to 2 ATAPI . Audio: Realtek ALC203 AC97 Codec. I/O Ports: 2 x RS232 Serial Ports, 4 x USB2.0 ports, 1 x silm FDD, 1 x 8- bit GPIO, 1 x PS/2 keyboard and mouse ports. Extended Interface: One Mini-PCI socket. SSD: One CompactFlash Type I/II socket. CPU: Embedded AMD Geode LX800 Processor . Memory: One 200-pin SO-DIMM socket supports up to 1GB DDR SDRAM. Audio Interface: Realtek ALC203 AC97 Audio. LAN Interface: 1 x Realtek RTL8110S Gigabit Ethernet controller. 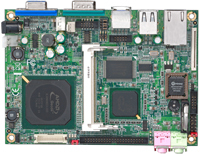 Extended Interface: 1 x Mini-PCI socket. Power Requirement: DC 12V input . AMD LX800 processor with onboard VGA, LVDS, Giga LAN, RS232, GPIO, USB2.0, Audio, Mini-PCI & CompactFlash socket.